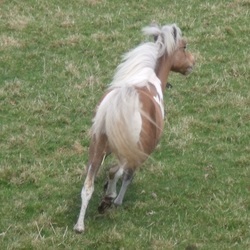 This little girl is everything we wanted in a tiny package..conformation..character in waterfalls.. lovely paces.. He will be remembered in the miniature history books as one of the greatest producing stallions of all time. He is the sire of "Liberty's Miss Kentucky"- the three time AMHA Champion of Champions. He is also a full brother to the World Grand Champion Stallion "Little Kings Buckeroo Baccara".